With the rise of Virtual Reality, developers started asking for advice on the most suitable audio technologies available to best carry that sense of immersion they were seeking. As much as we wanted to guide them, there’s simply no one-size fits all solution for all games and VR experiences in development. Considerations such as hardware or software rendering for binaural plug-ins, cross-platform support, gameplay or storytelling genres, and artistic or personal taste, are all elements to factor in. 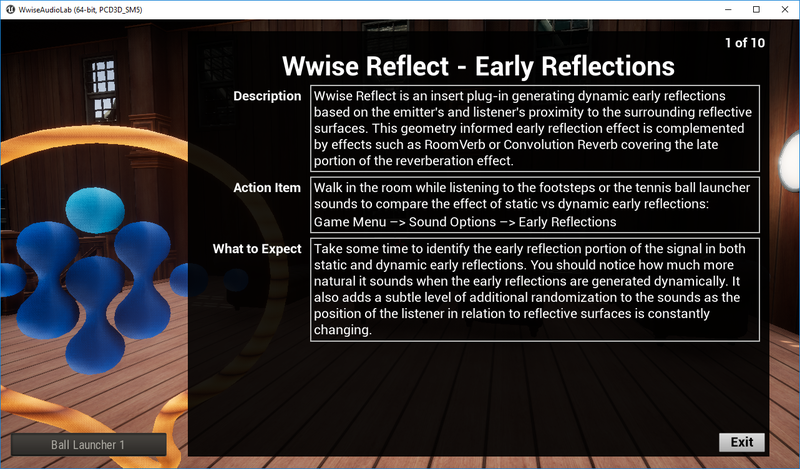 At the same time, we were midcourse in the development of what has become Wwise Reflect, our geometry-informed early reflections plug-in, as well as a series of major enhancements in the Wwise Spatial Audio feature set, such as 3D busses, portals, oriented reverb, etc. 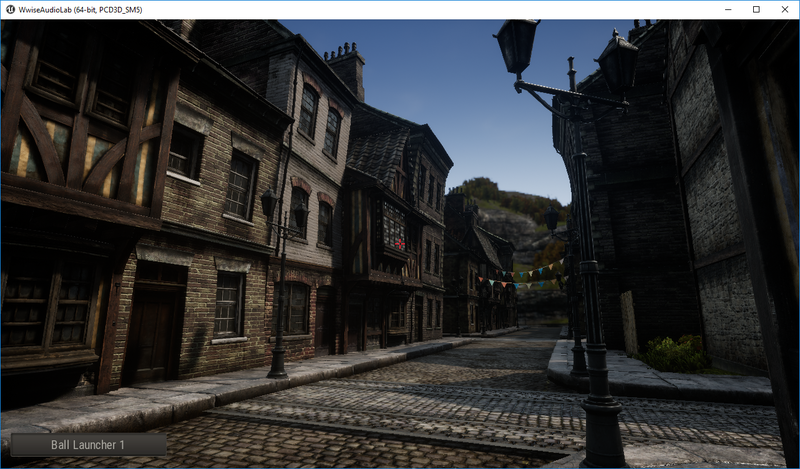 The more improvements we made, the more obvious it became that a game-like 3D environment where we could test various spatial audio scenarios was needed. 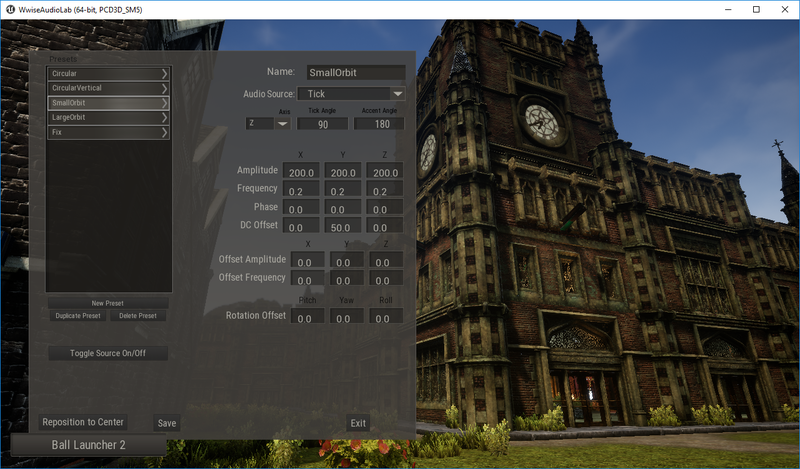 Based on these premises, the Wwise Audio Lab project was born: a pseudo game environment focused on exposing various spatial audio phenomena that would run on Windows and Mac, but also in VR on Oculus and HTC Vive. 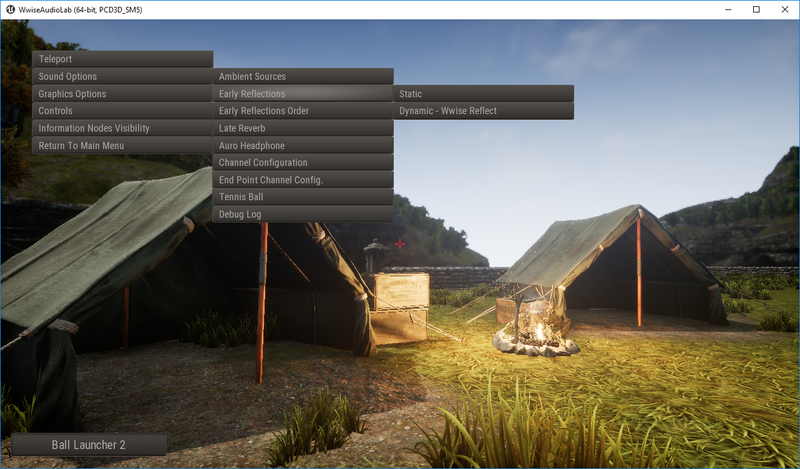 The sources of the Wwise project would be publically available, alongside the precompiled or the full sources of the UE4 project used to create that game. Here's an overview video on the Wwise Audio Lab! The WAL (Wwise Audio Lab) presents two levels that expose various opportunities for testing and comparing spatial audio techniques and technologies. The Village level exposes different room sizes and shapes, but also a large exterior with fields, mountains and streets. 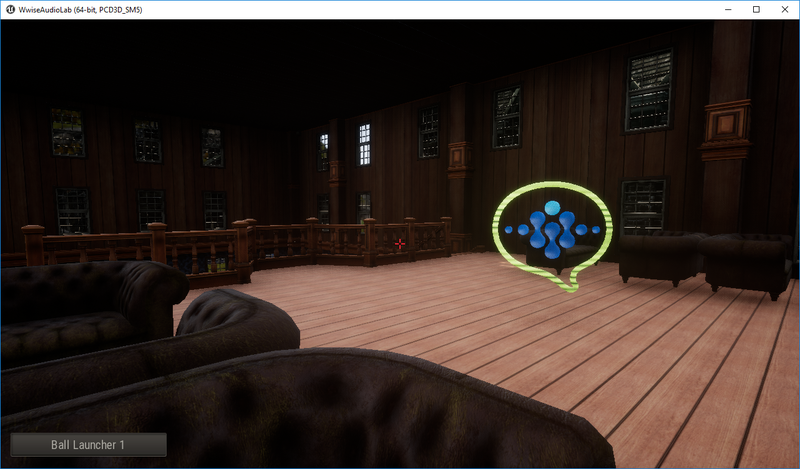 The Echo Chamber level is quite useful for testing dynamic early reflections as the dimensions and the acoustic textures of the room can be modified in real-time. Apart from Wwise Reflect and comparing static with dynamic early reflections, you are able to compare and experiment with sound portals, oriented reverb, occlusion and obstruction, audio LOD (level of detail), ambisonics vs. quad, binaural vs. standard stereo, etc. Some scenarios requires connecting Wwise to the game, but most features are directly integrated in the game, and A-B comparisons can be executed in a few seconds from the sound options menu. To keep the user immersed as much as possible (and to reduce the need of reading documentation! ), we added information nodes at various places in the levels to indicate areas of interest, as a sort of in-game training or guided visit. Information nodes offer brief descriptions of elements of interest, how to interact with them in the game or in Wwise, and provide an idea of what to expect. Another important aspect to appreciate spatial audio phenomena is the ability to get predictable and reproducible scenarios. For that, we designed a flying radio that has a few channels such as music, dialogue, white noise, and tics (sounds that can easily be changed with your own material via a quick modification to the Wwise project), and a preset mechanism that can be customized and saved by the player. The radio interface may be intimidating at first, but it’s quite powerful. The radio movements are defined similarly to a 3D oscilloscope, where properties such as frequency, amplitude, phase and DC offset can be set on each of the three axis. It makes for an ideal tool to test various binaural technologies or surround sound systems configurations for example. 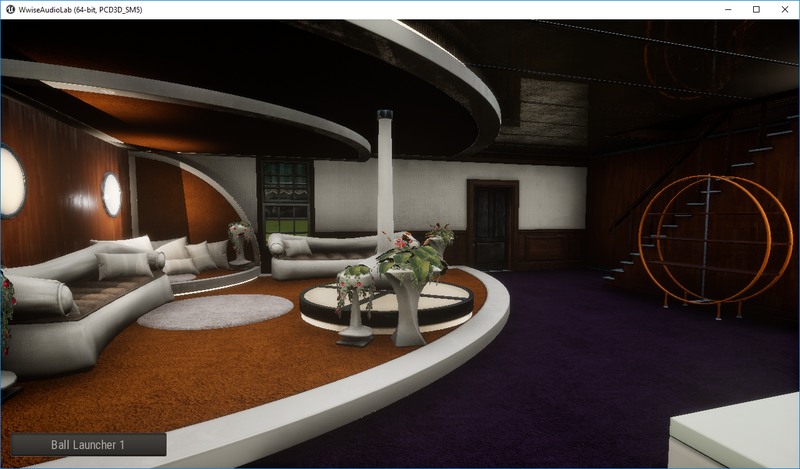 I’d like to express my sincere gratitude to Guillaume Provost from Compulsion Games, who offered graphic assets from their game We Happy Few to build the Village level. That was really helpful as it sped up the development quite a lot. I’m also particularly grateful that Guillaume gave his approval after we showed him what we’ve done, even though we sabotaged the dark and gloomy ambiance of the game by trashing the dynamic lighting (a cheap way for us to optimize graphics, but mostly a demonstration that Audiokinetic does not have much knowledge in graphic production! 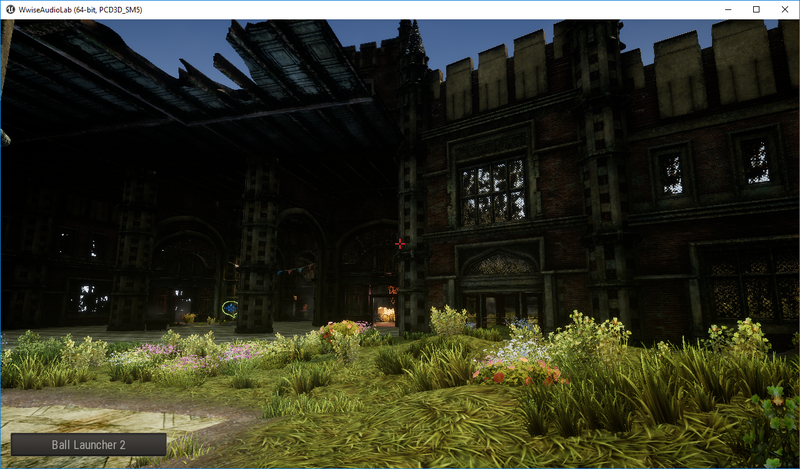 ), the skybox (a bit too dark for some of our audience) and all the NPC’s! Guillaume recommended that we work with 3D artist Warren Marshall to assemble the levels and create new props and terrain. I really appreciated working with Warren as he has been really creative and efficient. Just hoped he had more time to polish, but it was a really tight mandate and I can only praise what he’s been able to accomplish during our tight production schedule. 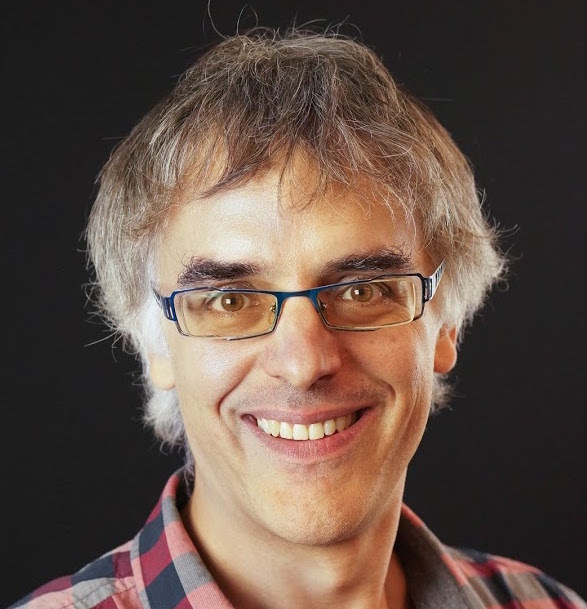 I would also like to thank Matt Shores and François Bertrand from Empty Clip Studios, who handled the programming aspect of the game as well as hiring Disruptive Games for additional engineering. It was a bumpy route at times, but they delivered! Thanks to Toussaint Renaud from Signal Space for the Foley, menu and some ambient sounds. Thanks to Stéphane Larivière from Sonorum for all the room tones delivered in both Ambisonics and Quad so that we can compare the same recordings rendered in both formats. And finally, there are many people at Audiokinetic who have helped in various ways; QA, documentation, localization, implementation, communication, etc. Probably too many to name here, but I’d like to briefly put the spotlight on Benoît Santerre, who did an amazing job at implementing most of the audio features while also playing build master, lead programmer and blueprint master on this project. Thanks Benoît! I hope you’ll have as much fun as I have had exploring the various features of WAL (slowing down the speed of sound in Wwise Reflect is a good one), but I mostly hope some of the material present in there will be useful for your current and future projects. If you wish to change the content and geometry of the game, you can download the full project, but most users simply need the compiled version with the Wwise project. Both versions are available directly from the Wwise Launcher. Request access to the Wwise Audio Lab Slack Channel ! Looks amazing! Thanks Simon and all the good people who put this together! The WAL is amazing! Thank you so much for this tool!! Thank you Simon! A small step for Wwise a giant step for game audio industry! How can I view the in VR - I have a Oculus Go, can i just import the the program file ? Thanks Simon,I love Wwise,it's very awesome! Good job,Wwise team!